A young girl born in Hong Kong moves to Canada with her family after the crushing of a student rebellion at Tiananmen Square in Beijing. Some twenty years later, she returns and through her reporting, we are permitted a peek behind the silk curtain, for now. Her name is Joanna Chiu. She grew up in Vancouver and became a journalist, following a tug at something not quite heritable, but somehow inherent, a desire to understand her motherland and the culture that formed her career. As Joanna grew up in western Canada, she read about the June-fourth massacre, the Kuomintang, Sun Yat-sen, Chiang Kai-shek, and the shaping of a country she couldn't know fully from her immigrant home. Joanna became increasingly curious about what her life might have been like had she been born on the mainland, where daughters are a burden to traditional-minded families under China's one-child policy (recently expanded to two). She read articles about how girls are often abandoned or given up for adoption. Would her own family have not wanted her? Many of China's policies and idiosyncrasies have been described as opaque, but as a parent, particularly an adoptive western parent as I am, the concepts of family and single parenthood in the context of state oversight are downright impenetrable. For some insight, I recommend Joanna's piece, Single Parents: Pariahs, but I must caution you to set aside extra time; you'll want to read more of her work. Joanna was lucky; born to a middle-class family in Hong Kong who saw Tiananmen as auguring the spread of oppression into Hong Kong once the British relinquished control of the island back to the PRC in 1997. Her family fled to Canada, as hundreds had before and many thousands have since, "replicating" as Joanna says, "the stores, restaurants, and cafes." She wanted to learn more than what she read in western books and knew she had been given, "a unique opportunity to live and be educated in Canada, to have all this information freely available to me." A self-professed nerdy kid, she spent much of her free time in the library. "I had the sense that I was uniquely placed to try and learn more and became driven to learn about China's history." Joanna was a history major at the University of British Columbia and took a lot of Chinese history courses, nailing a history honors degree which allowed her to pursue her own research. Joanna spoke Cantonese at home but at college studied Mandarin, the Beijing dialect. She later attended Columbia University for her Masters in journalism, where she was awarded a Leo Hindery fellowship. Throughout her life she had read so much about China she was drawn to be in the country. At Columbia, Joanna took numerous courses in foreign correspondence, "I wanted to be a China correspondent by twenty-five." Columbia had a relationship with the South China Morning Post (SCMP) for whom she interned in Hong Kong. She soon landed a staff reporter job and worked out of that office for roughly three years, writing as many China stories as she could and wrangling trips to the mainland, making connections and working diligently to establish herself and her sources. She also freelanced when she could, writing for the AP and The Economist, for whom she was the main writer in Hong Kong for about eighteen months. Joanna explained there are limited journalist visas for China so it's competitive, she had to work very hard to fill her resume. She eventually did some work for her current employer, Deutsche Presse-Agentur (DPA). After freelancing for them in Hong Kong she jumped on an opening in Beijing and moved there to work full time for DPA in November 2014. Putting aside the idea that Joanna lives with two industrial air filters to clear her studio apartment of the pollution, "Working in Beijing I felt I had a more manageable pace of life. In Hong Kong I was writing features, traveling for stories, freelancing and juggling assignments for my day job, Hong Kong daily news reporting. In Beijing, I could focus and take my time to develop stories." 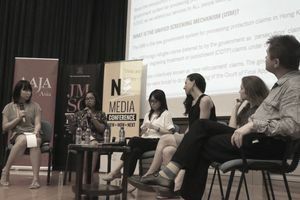 The new challenge in Beijing was learning how to read the newswire and determine what was breaking, how to write for a newswire organization. She also continued to balance daily reporting work with freelance assignments and appearances on outlets like BBC World. Joanna doesn't shy from challenges. Check out her story of living in a "squalid subdivided flat" to understand the breadth of Hong Kong's housing shortage. For someone who has lived in Vancouver and NYC, this experience; the grimy walls, layers of dirt, moldy pillows and claustrophobic conditions, was sobering. What has she learned that can't be taught in journalism classes? "The most intense experience was covering the Occupy Movement, (It wasn't simply the sanguine Umbrella Revolution as depicted here in the west—evidenced by some of Joanna's social media posts from that time). Working as a journalist in China you have to learn to be cautious in approaching people and sources, being careful to chat in person rather than online. You have to learn to deal with people who were your sources suddenly unable to talk to you any longer. I've had experiences where people I had gotten to know had been put in jail. That really made it hit home for me that I was a reporter in China. There's been a crackdown on civil society. People I met with, who weren't worried a few years ago, are now behind bars." But Joanna said there’s no point for journalists to try to self-censor in order to avoid retaliation from authorities, which have blocked media outlets and refused to renew correspondents’ press visas in the past. “You don’t know what might upset who in the government, or why. Reuters’ website was blocked for one small critical quote they used in an article. Some things are obvious like the investigations into the family wealth of Xi Jinping and Wen Jiabao." I wondered if transplanting yourself into an environment like that of Beijing was the best training for a correspondent. Joanna said it depends on your goal. "If you want to be an investigative reporter, this is not the best place. But I've definitely grown as a person through this experience." While in Hong Kong Joanna was sent to Indonesia to cover the story of Erwiana, a domestic worker who had been brutalized by her employer (Indonesian maid Erwiana was 'prisoner' in employer's home, father claim) for the SCMP. The woman was a prisoner in her employer's home and beaten savagely. Joanna covered the story extensively. She was the first and has since followed up on Erwiana's new life in school and learning to free her mind of the abuse. Covering this case taught Joanna a lot about finding the unique take on a story, building trust in a minority community that may be reluctant to deal with the media. "I learned to be prepared. Journalism isn't about parachuting in somewhere and writing off the cuff. You have to be a student of the society you're in and meet as many people as you can." An interesting sidebar. Joanna had to learn to be more assertive and less innocent (read, Canadian) in Beijing, lest she gets taken advantage of or cheated by locals in stores, cabs or rental offices. "I took a trip thru Hainan Province and the queues at the airport were chaotic. I yelled at people to move to the back of the line." I can't imagine her yelling because she is so soft-spoken. Joanna said, "people have different personalities in other languages. In Chinese, I'm more aggressive." In Canada mode, she is exceedingly polite. If you have limited time to explore the world of Joanna Chiu, please read about her reporting from Mongolia. She covers both countries for DPA. Space here is limited, but this story is worth reading and I urge you to explore Joanna's work. Start with her article archives on her website. Joanna is serious but allows her humor to slip thru as she becomes more comfortable. Curling up with friends on the couch, "watching movies and slurping noodles" seems to suit her, though it belies her tenacity. As much as she has learned from this experience, Joanna has misgivings about whether she has fulfilled her mission to learn about China. "I more and more feel as though I've not come close to understanding and ​doing what I want in China. I want to travel more outside of Beijing and Shanghai and cover stories people wouldn't be able to imagine. I want to do more longer-term stories and possibly a book." Joanna's advice for journalism students. "If you're interested in a place, just go there. There's only so much preparation you can do. If you can't get a job as a journalist, get another job and freelance on the side." That's Joanna; just do it.